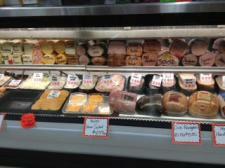 Our deli offers the best meats, cheeses & other goodies to satisfy your needs. Looking for a meat, cheese or produce tray for your next event? Ask Kevin or Kyle today - they can help you decide what to get and how much you will need. Get 2-3 slices or 2-3lbs. We will slice it fresh to order! We have 20 different lunch meats and 15 different cheeses. We also have ham salad, chicken salad, seafood salad, bbq beans, potato and macaroni salad, and several others to choose from.